There's an old saying in the brutal, lightning-fast world of Thai boxing: "A good pad man is worth a million dollars." 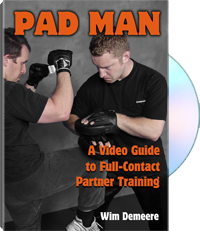 In Pad Man: A Video Guide to Full-Contact Partner Training,master martial artist Wim Demeere teaches you how to join that "million-dollar" league, no matter what combat art you practice. In this comprehensive four-disc DVD set, Demeere uses focus mitts, Thai pads, and kicking shields of all sizes to show you how to train your partner for anything from a high-powered MMA match to a street fight. Using the tricks of the trade that he learned the hard way, he'll teach you the body mechanics that will let you avoid injury and prepare your partner to strike and kick his hardest against a reactive and rock-solid target. If you can't stand up to your partner's toughest moves, you're only giving him half a workout. Demeere will train you to handle high-line and low-line punches and kicks, ground fighting techniques,shoulder slams, stomps and rising strikes—basically every move that your partner needs to burn into his muscle memory to compete at the highest level. There's more to being a good training partner than just standing there and taking a hit— that's what dummies are for. Wise up and learn things about pad training that you don't even realize you need.